On a 1995 research cruise in the Arabian Sea, WHOI Research Engineer Paul Fucile asked an innocent question, just to satisfy his curiosity. He had been watching a three-person Naval Research Laboratory (NRL) team use a deck-mounted winch and a steel wire to maneuver a half-ton, golf-cart-sized, $500,000 piece of equipment called the High Intake Defined EXcitation (HIDEX) photometer. It was monsoon season, the weather was rough, and the crew struggled to lower HIDEX safely over the side. “What do you measure with that?” Fucile asked, not thinking that his query would launch him into a completely new line of research. The answer was “light”—light created by living things. Marine organisms ranging from bacteria to fish make their own chemically induced light—called bioluminescence—to hunt, frighten predators, attract mates, communicate, or camouflage themselves. Movement in the water excites marine life to glow. It also stimulates the Navy’s interest. Bioluminescence has betrayed the positions of submarines and sealed their doom. Sailors have detected the luminous wakes of torpedoes. Returning pilots have followed luminescent trails over many miles to find their aircraft carriers, as have their enemies. Navy SEALs are mindful of certain beaches where bioluminescence would give them away. Bioluminescence is ubiquitous in the oceans, and especially prevalent in coastal regions where nutrients are abundant and life thrives. Yet scientists have little basic understanding of how bioluminescence is influenced by water temperatures, depths, seasons, geographic locations, even different times of day. They have been limited by a scarcity of observations and instruments to make them. After watching his colleagues’ difficulties with HIDEX, Fucile spent his night watch that evening drawing a sketch for a light-sensing instrument that was smaller, sturdier, less complicated, and less expensive. From the ship, he e-mailed a list of materials to WHOI Experimental Machinist Mark St. Pierre, asking him to get them ready so that Fucile could start construction as soon as he returned. 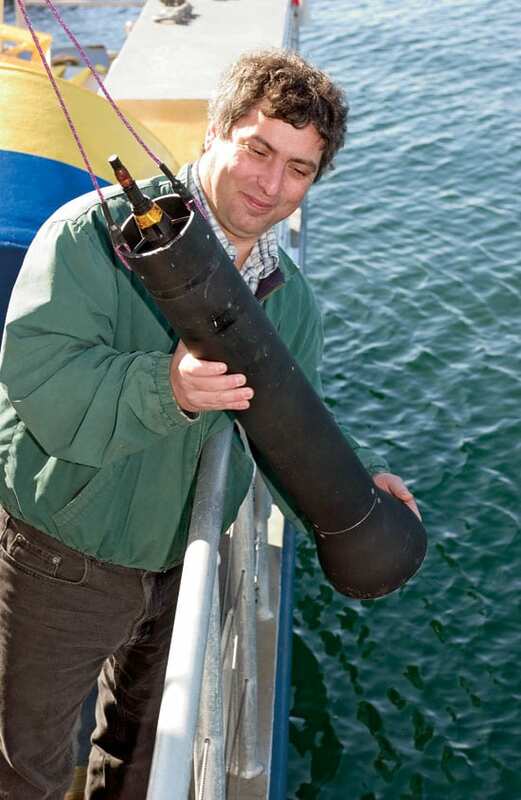 Eight weeks later, back in the Arabian Sea with the same NRL team, Fucile tested a prototype of his bathy-photometer, an instrument to measure bioluminescence in the ocean. The NRL team was impressed with the initial results. 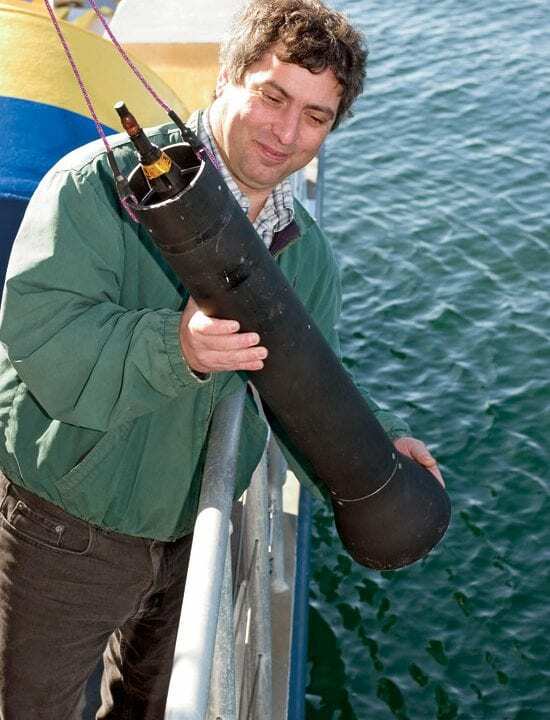 It worked well enough to earn Fucile a Cecil H. and Ida M. Green Technology Innovation Award, given to WHOI engineers to launch new ideas in instrumentation or technology. A year later, he was awarded an Office of Naval Research grant. Fucile’s patented 10-pound, 28-inch-long instrument is so inexpensive, it’s expendable. His Expendable Bathy-Photometers (XBPMs) can be easily transported and pitched over the side of a ship by one person even in the worst weather conditions. As they descend, the XBPMs spool out a thread-like wire that transmits digital data to a computer on deck. Fucile also developed and patented this telemetry system. The sophisticated HIDEX is capable of making a wide range of subtle measurements, including distinguishing individual types of bioluminescent plankton. 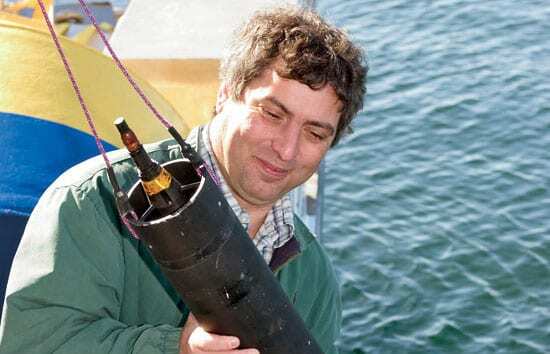 But for the first-order task of measuring bioluminescence levels, the XBPM is about 90 percent as accurate as HIDEX—without HIDEX’s fragile and expensive glass-tube technology. Thus, Fucile envisions that XBPMs could be launched from submarines, deployed by SEALs, dropped from airplanes, and used on fleets of gliders. Beyond military research, XBPMs are already being used in an environmental study of Bioluminescent Bay in Vieques, Puerto Rico. The bay, named for its rich marine life, is now deteriorating because of a surge of coastal construction. In the future, Fucile hopes that musters of XBPMs will be used routinely by scientists to make inroads into our now-sparse knowledge of bioluminescence.